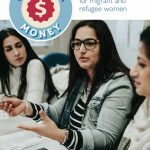 This ‘Let’s Talk Money’ promotional brochure outlines why the program has been designed for refugee and migrant women and describes the bilingual peer educator approach which delivers financial education on topics such as budgeting, saving, tenancy rights, banking and debt management. The independent evaluation report (left) and summary (below) of the 2018 ‘Let’s Talk Money’ program has been made possible through the generous support of Financial Literacy Australia (now Ecstra Foundation). 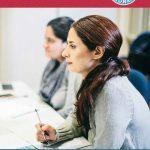 The ‘Let’s Talk Money’ workshop request form is for migrant and refugee women wanting to participate in the program during 2019–2020. 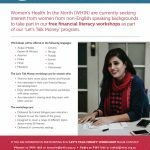 Managing Money: Every Woman’s Business is a financial education program that provides culturally and gender-sensitive financial information for women wanting to develop their financial skills. Living Longer On Less: Women, paid work, and superannuation in Victoria, Australia examines the paid work experiences of women aged over 55 years of age with less than $100,000 in superannuation. To understand the work that underpins the resources on this page, visit the Economic Equality page in the ‘Current Work’ section of our website.